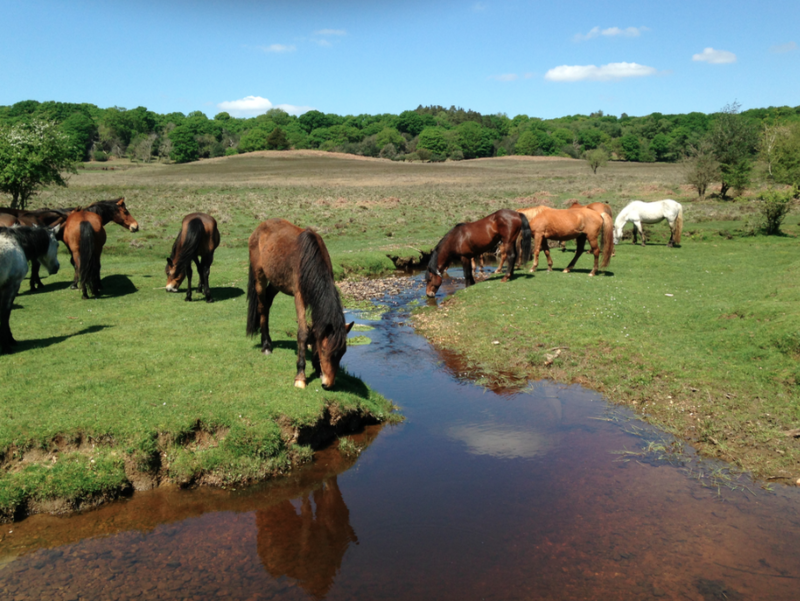 A New Forest stallion takes a drink – chasing mares is thirsty work! This week (May 2016) I found one of my mares that I hadn’t seen in a while. The Agister had seen her. Other commoners had seen her. Possibly many visitors –walkers, cyclists, horse riders, bird watchers etc. – had seen her. But she had eluded me for some considerable time. This particular bay pony had changed territories and switched to a herd that roamed on the other side of the valley. She had managed to get inside one of the Forestry inclosures and had been let back out onto the Open Forest, but on the farthest side from where she’d entered. This prevented her from returning home. I was regularly checking the area for her to try and locate which haunt she was in and discover what herd she was running with. Every group with a bay coloured pony would have to be inspected to see if it was she. This meant covering lots of ground, on foot, to check each herd or individual. Luckily she had enough distinguishing features that I could tell from a distance whether or not my search would finally be over. But up until now I had had no luck in tracking her down. Recently I started out again to look for her. It was a beautiful sunny day, with a light breeze to cool the temperatures. At first there didn’t seem to be that many ponies about. I saw a small band grazing on the crest of a hill just beyond a stretch of valley mire and decided to check them out. The ponies moved away from me down the other side of the hill just out of sight and, once I’d made a big sweep around the wetland area, I followed them. As I crested the hill in search of the small band, the sight of at least 40 ponies greeted me. They were all happily grazing together. 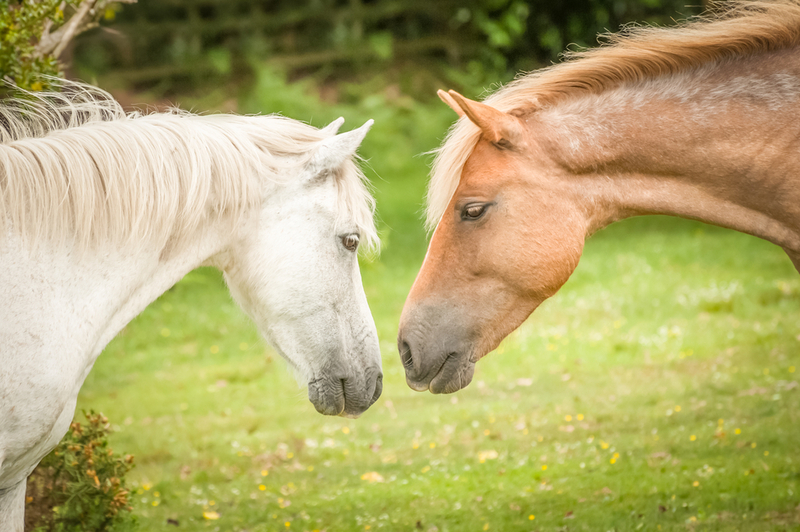 To have such a large group of ponies together in one place could only be due to one thing – the presence of a stallion. Sure enough a handsome dark bay stallion with an impossibly shiny coat stalked through the herd checking to see which of the mares were becoming receptive to his charms. He’d sniff them nostrils to nostrils or check them from behind and as he did there were lots of accompanying shrieks from him and the excited mares. As I stood at the top of the hill I could see mares from the surrounding area making their way to where the stallion was. His magnetic presence on the mares in the area can only be described as ‘the Lynx effect’. I had a good view from my position to survey the herd and among the assembly of eager mares I saw the unmistakeable outline of my own missing pony. At last I had found her! I wandered down to her and checked her over. She looked in good health and condition. The stallion was still swaggering amongst the mares and I couldn’t help but wonder if my mare would succumb to his amorous advances before his four week ‘tour-of-duty’ was over. He certainly would make a fine sire for any future foals. If she did become in-foal to him I would most certainly have to keep a closer eye on her and might even consider bringing her back home. But for now, she looked happy, healthy and content to stay where she was. This entry was posted in New Forest, New Forest pony and tagged dam, foals, Forestry, Lynx effect, mare, mating, New forest, sire, stallions. Bookmark the permalink.